Don't Eat the Paste: National Can-It-Forward Day- giveaway! National Can-It-Forward Day is winding down. But the fun doesn't have to stop. Ball has lots of links, recipes and videos posted year round. What did we do? More jellies! We have lots of friends who can, and have exchanges with them, I really recommend it. Find out who cans, or who you know who has an interest in it. What they grow, what they might want to can and preserve will be different from what you want to do. It's a fun way to try all sorts of things. For example, one of my best friends does amazing mixed fruit jams, but doesn't do salsa or pickles. I grow cilantro and dill for canning salsas and green beans. So we swap, and return each other's jars filled with new things. You can find my son's favorite pickled pepper recipe HERE. Ball is sponsoring giveaways on a whole bunch of blogs, including mine! The idea is to get more people enthused about canning. This is the the Ball Canning Discovery Kit. The basket is made of polypropylene which works just fine at boiling temps and will hold 3 pint jars easily. It fits into your lidded stock pot for hot water bath canning and comes with jars and a basic how to can booklet. I have one, and use it regularly. Ball sent me a second one for this year's Can It Forward Day, and it belongs to my daughter who wanted her own set. Perfect for small batch canning, or for beginners who want to start with small batches. Ball Blue Book Guide to Preserving- Beyond just canning, this also covers dehydrating and freezing food to preserve it. 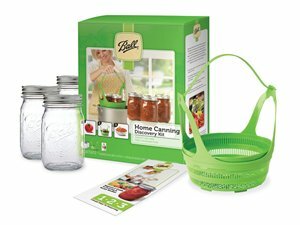 Essential for the beginning canner, and a helpful reference for people who have been canning a while. 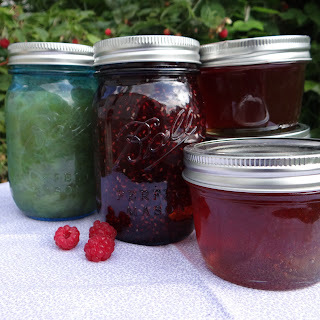 This is updated regularly for the very newest information on safe canning, has lots of full color photos and clear explanations on how to can, and instructions and recipes for almost everything the home canner needs. I have several years worth of Ball's Blue Book and recommend it. The recipe for the rhubarb above was done from this book by my daughter who has never canned before this year. The other part of the prize package is a coupon good for 1 case of jars, which come with lids and bands. , Ball jars have been the standard for home canning for as long as I remember. They are uniform, easy to find replacement bands and lids for, they are great quality, and will last for years. The compound on the lids seals effectively and easily. Ball Canning provided the products reviewed for me free of charge. There was no other compensation, and this is my honest opinion of the products. And my daughter made jam, jelly and preserves by herself and has the canning bug in a big way. This morning I got to enjoy fruit punch jelly on toast and it was fantastic! 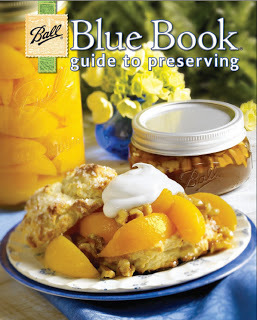 The Blue Book Guide to Preserving is the canning bible. Crossing my fingers and swimming in tomatoes right now lol Thanks for setting this up!